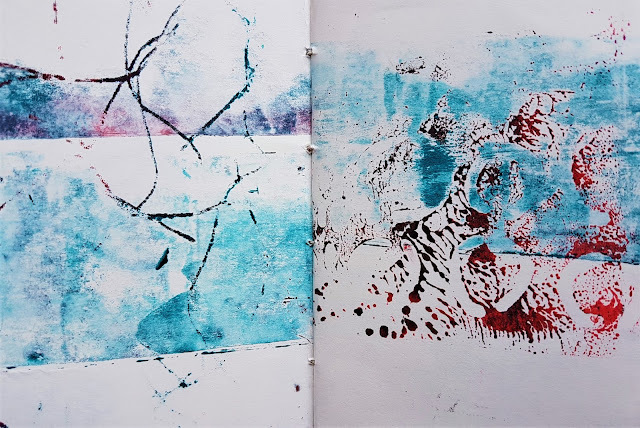 Last week, I was lucky enough to go on a four day workshop with Lynda Monk – in Dorset, which is a very long way from Leicestershire! It was a challenge for me to travel so far and there are not many artists I would do that for but I had attended a day's workshop with Lynda a couple of years ago and it was so good that I jumped at the chance. I suppose you could call it a creative retreat. It was located in the beautiful setting of The Kingcombe Centre, part of Dorset Wildlife Trust, and we felt very much removed from the outside world, particularly as the internet and phone signals were rather unpredictable. It was very well organised by Maria Swain and Ann Emery and they certainly chose a wonderful place to be. Having broken my long journey at Bristol, it took a couple of hours more to get there and the closer I got, the narrower the roads became, until I was driving along single track lanes brimming with wildflowers. Breathtakingly beautiful ... and I pulled into the gate at Kingcombe just in time for lunch – the first of many delicious meals. 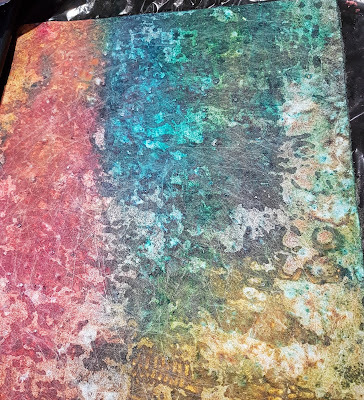 After a quick introduction from Lynda, we spent the afternoon producing resources to be used during the following days – surfaces with layers of Lutradur of different weights, tissue, various mediums and adding colour with paint, ink or dyes, with some liberal sprinkling of salt. 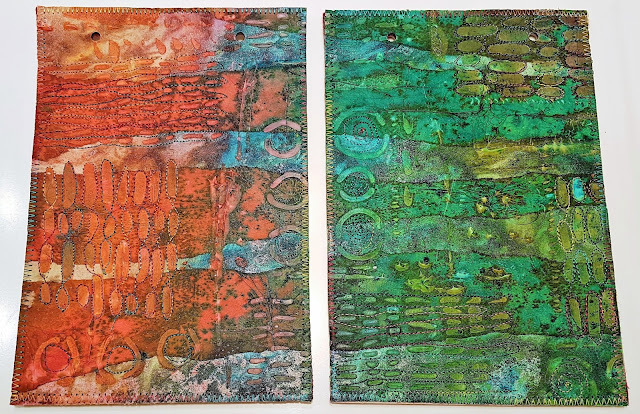 I was particularly pleased with the stencilled moulding paste sample and would like to try it on a much larger scale. We also had a messy time with Modroc, which I’d seen in school in my former teaching life, but had never had the chance to use myself. We layered it over a balloon to make a bowl. After another delicious meal (I won’t mention any more meals! ), we returned to the studio for the evening session - a very interesting talk from Lynda, about her personal journey into the textile art world. 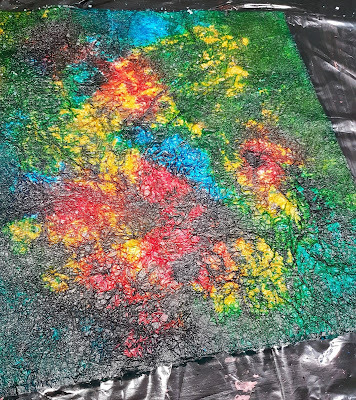 Day 2 dawned bright and sunny and we continued working on the surfaces we’d made the day before and producing more, using painted Tyvek paper, layered in various combinations with acrylic felt, foil, fabric, thermofax screen prints and bubble wrap! I was so busy that I completely forgot to take any photos so these were taken later. We had the option of working on into the evenings until at least 9.30 and most people chose to do that, fortified with wine and chocolate. I certainly needed to if I had any chance of keeping up! The following morning, we had an interesting little added extra as the Kingcombe Centre had kindly set up the moth trap overnight and we had a little look at the various specimens inside. Unfortunately, I can't remember the names of these two lovely creatures. Day 3 in the course notes was flagged up by Lynda as ‘busy' – we smiled and wondered what the previous day and a half had been in her eyes! Joking aside, she is an excellent tutor who caters for all - fast workers, who finish every activity quickly and those, like me, who take a lot longer. 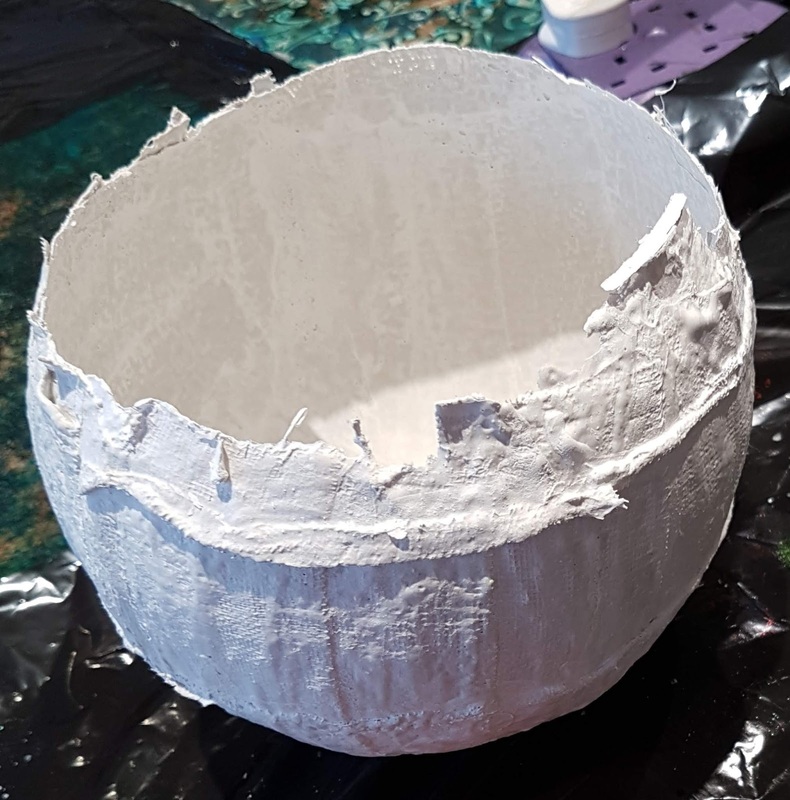 We removed the balloons and covered our Modroc bowls with a layer of gesso, which I used to attach some scrim, both around the top to soften the edge and to emphasise the spiral line going around it. 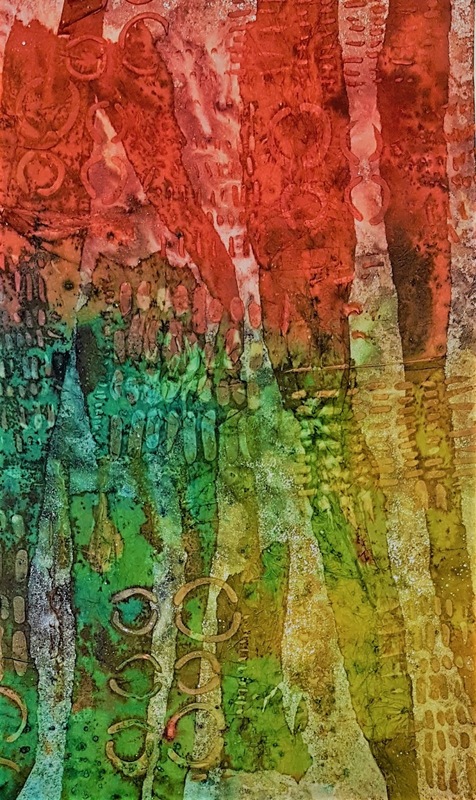 This was followed with a layer of white acrylic paint. 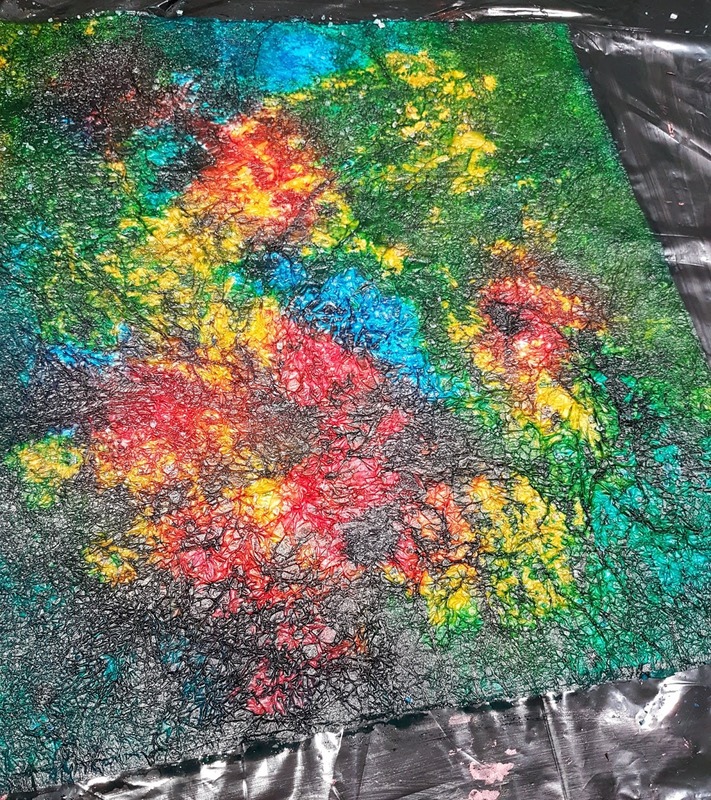 When it was dry, I drilled holes in it to enable me to stitch later and then painted it with contrasting layers of Golden fluid acrylic paint. I rubbed back the top layer to reveal the bottom layer in places. 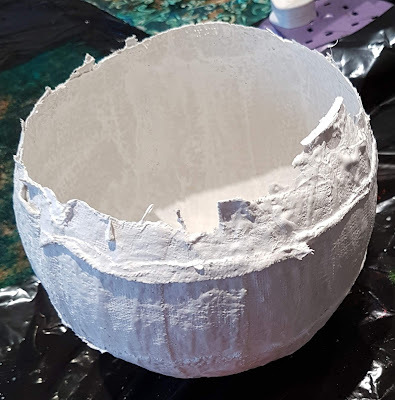 An unfinished vessel which will be painted in a similar fashion to the bowl. It needs some work as I’m not sure about the Xpandaprint ‘lumps’ which look a bit like popcorn stuck on. White acrylic felt, with various layers underneath, was free-machined in random wavy lines, cut with a soldering iron and then sewn around a tube, before application of gesso and aforementioned Xpandaprint. Heat was applied and there you have it – popcorn! 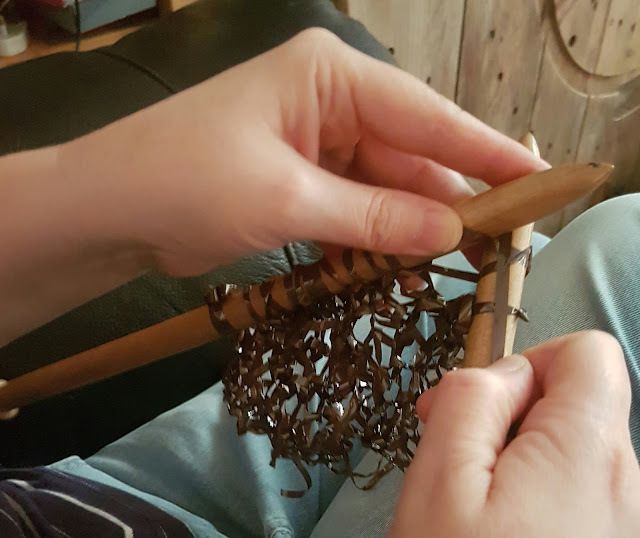 An unfinished hanging of cotton duck, layered with a woollen blanket, using a very similar technique to the vessel to produce a raised area in the centre. The photo shows it at a very early stage. It will have more stitched lines and be covered with gesso, white acrylic and painted with fluid acrylics as before. As you can see, it has been heated and burnt but all will be hidden! 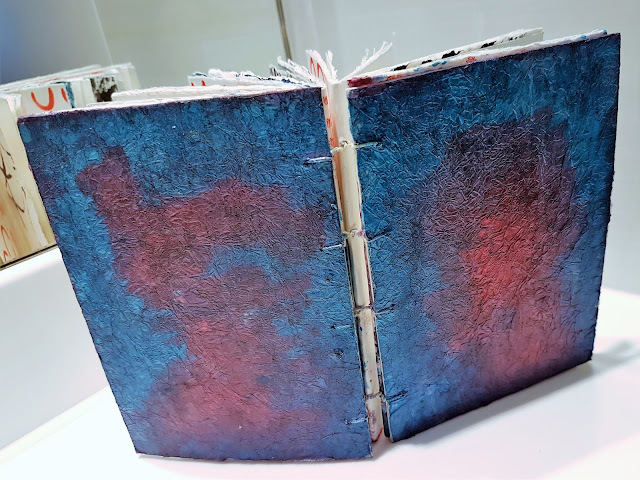 The stencilled piece was prepared to make a small sketchbook by attaching it to a layer of felt, adding some free motion stitch and gluing it to book board. The holes are for the (lost) book screws which will hold the pages when I find where they are hiding! 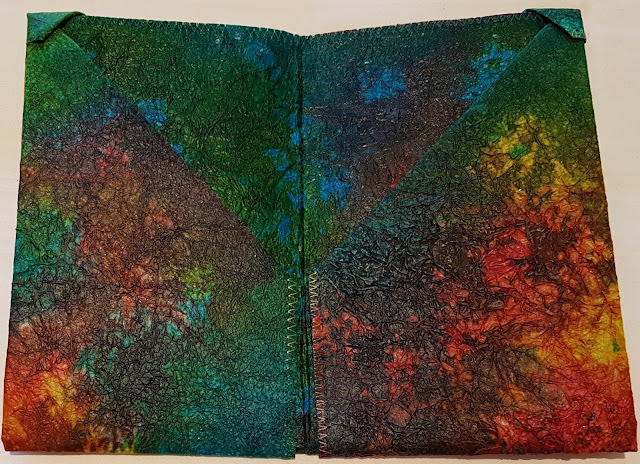 A folded pocket book out of the painted layered scrumpled tissue paper sample, which was first protected with acrylic wax. It has to be said that several people on the course finished a lot more than that; some stitched and framed their samples or used them to make different book covers, while others went away with patterns and plans to make bags or small decorative shoes. However, I was well and truly happy with what I achieved; the whole experience was fantastic and I felt very lucky to have been there in that concentrated, creative environment with a wonderful tutor and such talented, friendly people. I sat in my Bristol hotel on the way home, stitching my bowl - very tired but with a huge smile on my face. Traverse is in a new season. We have finished all our work for the 'Destinations' theme and have seen it exhibited twice this year already. We will be exhibiting 'Destinations' again at the West Country Quilt & Textile Show at the end of August. And there's a possibility that we may also be at The Craft Show at the NEC in November. So onward into our new season with a new theme. We met together last weekend which was both bittersweet and exciting. We missed Jan and talked about her often over the weekend. However we were excited to welcome Becca to her first Traverse session. She is coming towards the end of her course at the Windsor School of Art and will be exhibiting with Traverse in 2019. Revealed, with its antonyms and synonyms, gives us a wide spectrum of areas to take our work. And in its early stages, raises lots of questions including - should our work be technique-based or concept-based? Each of us will be pondering other questions once we've each found the area we wish to work with. During our weekend session we talked about our thoughts for Revealed so far. What do we want to reveal? What will remain hidden? 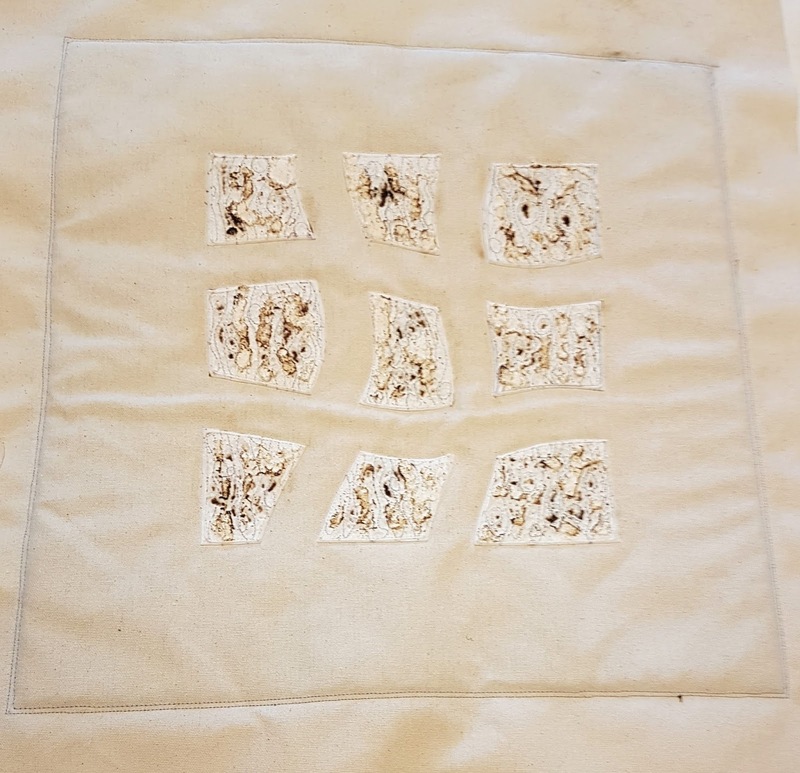 Deb started straightaway with the Embellisher using wool tops to make a background with holes. There are many stages to go with this and who knows where it will take her. Dia is currently thinking about weather currents and how the weather map reveals and hides parts of the UK. It will be exciting to see how her textile work develops. 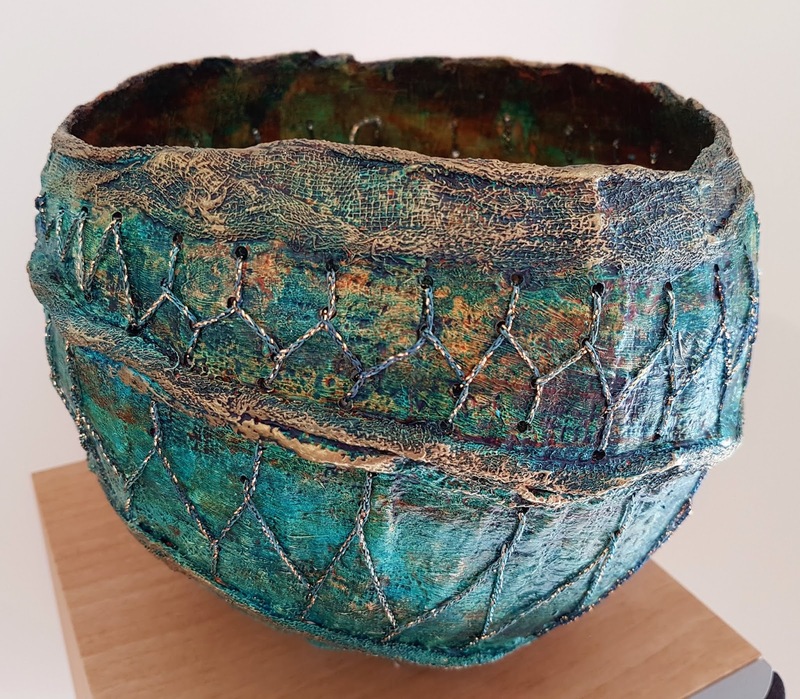 Cath is upcycling this piece, which she started many moons ago on a workshop with Alysn Midgelow-Marsden - the first time she'd ever tried free-motion machining through so many layers and one of them was copper shim! 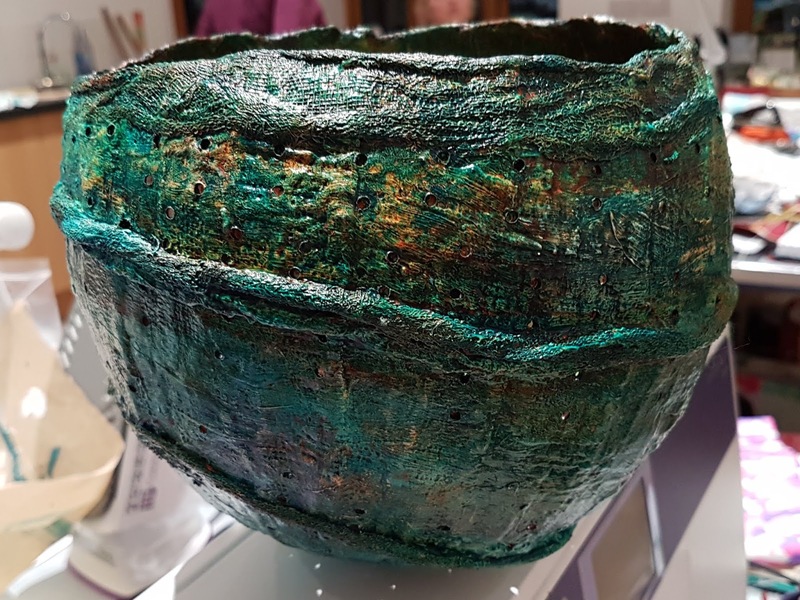 The application of heat to the copper beforehand revealed beautiful colour changes - a wonderful surprise. The hidden layers were then unveiled after stitching by cutting back through the velvet, silk and organza to see the copper beneath. Cath is looking forward to returning to this and taking it further - seeing it from a new perspective. Becca wants to continue with her work on 'Making the invisible visible'. She is looking at hidden illness and hidden disabilities - and deafness in particular. She is knitting audio tape to represent the jumbled word for deaf people. I'm still considering my options especially the question of being concept-led or technique-led. I am trying hard not to do 'hidden Venice'. I am very taken with a paper-wash technique I learned recently which I feel lends itself to revealed/concealed ideas. How much is revealed of the contents of the pocket depends on how much of the paper gets washed away - an intriguing prospect. Who knows where our ideas will take us? But it's exciting to have a new theme to work to for the next round of exhibitions.